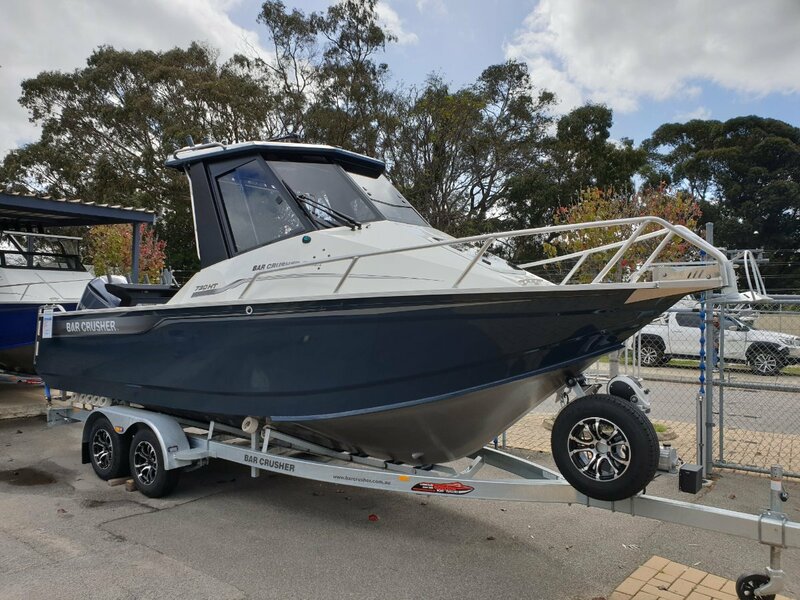 Brand New 2019 Model Bar Crusher 730HT Hard Top now available from Aquasports Marine, Perth's complete boating centre. "We are excited to be the new Bar Crusher dealers for Perth and the great up North region. We are here to help you with your new Bar Crusher research, so please, do not hesitate to contact us and see how we can help you get into one of these exciting offshore fishing rigs. Give us a call to find out about our easy finance options. " We have a huge amount of these exciting offshore rigs on order, so we will have a model to suit your needs and budget. From charging offshore to battle large pelagics to targeting inshore species with the family onboard, Bar Crusher's 730HT will get you there - quickly, safely and in comfort. Constructed from heavy duty, high-tensile 5mm (bottom sides) and 4mm (top sides) marine grade plate aluminium, the 730HT measures 7.30m LOA with a 2.45m beam. Its high-tech Waveslicer® non-pounding, deep-V hull delivers an ultra-smooth ride, the expertly-engineered Rigideck® sub-floor system ensures maximum hull strength and Bar Crusher's exclusive Quickflow® water ballast technology ensures the boat is extremely stable at rest. The 730HT's toughened safety glass windscreen and all-weather hard top allows full standing room and an unobstructed 360-degree view, while deluxe helm seats are mounted on top of heavy-duty seat boxes with storage. The helm station has ample space for electronics and the spacious cabin provides accommodation for overnight trips. The massive cockpit fishing area is ready for serious action too - generous internal depth with secure toe holds, Game Lock(TM) coaming for a comfortable fish-fighting position, self-draining deck with scuppers, step-through transom, marlin board with berley bucket, rod holders, plumbed livebait tank, in-floor fish storage tank and large-volume storage pockets which will easily accommodate tagpoles, gaffs and other essential equipment. The fully-welded checkerplate deck is extremely easy to clean after a solid day on the water. the 730HT includes a roller-door lock-up cabin, deck wash, overhead LED lighting, Stress Free anchor winch, electric macerator toilet and more. Rated to carry up to a 250hp outboard, the 730HT's superior performance capabilities, 330L fuel capacity (extreme long-range tank also available) and all-weather protection are just a few reasons why this model has quickly earned a reputation as one of the most. High tech features such as Waveslicer hull, Quickflow water ballast, Rigideck construction and the Barcatch self launch and retrieve mechanism are all standard inclusions on every Bar Crusher. Or let us help you design your own rig with a number of Bar Crusher options from there extensive list of upgrades. *** We can also supply and fit Lowrance, Simrad and Raymarine electronics at very competative pricing.